Everyone knows what happens when sockets are not properly stored in an organized manner. They end up being lost. The cost of replacing misplaced sockets is nothing compared with the frustration of need it and not having it because it is lost. A lot of time is wasted searching for the missing socket and this pushes back repairs or whatever is being built to complete a project. The only way to prevent such unpleasant situations is to invest into something practical like a toolbox or a socket organizer. Toolboxes are a more generic solution but the best bet would be to get a socket organizer. 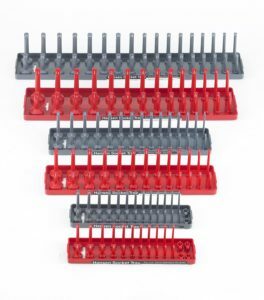 Socket organizers are very simple in the sense that they hold all the sockets on a board which allows them to be arranged in any order and prevents them from being misplaced. Many might not even know what a socket organizer is which is also a reason we built this list. Socket organizers should be the first thing that is purchased along with a set of sockets. Most sets do not include an organizer but there are a few that do offer one as a bonus. Everyone else might end up storing them in a drawer or a box. For our list, we selected 10 different socket organizers of different types, shapes, and sizes. The number of sockets they can store can vary a bit so that anyone can find a model that can be considered suitable for their needs. Without delay it any longer, let’s break down our recommendation for the top 10 best socket organizers in 2019 and why some models might be better than others. 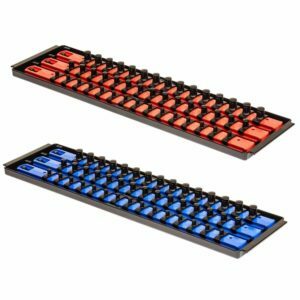 Which Socket Organizer To Pick? Olsa Tools socket organizer tray is a good pick for the ones that have serious problems with keeping track of everything. It is a simple organizer tray with 3 socket rails and a simple twist-lock mechanism. The model includes 15 clips for drive sockets and it is made mostly out of metal. It is a bit heavy but quite reliable. The organizer can hold up to 45 sockets with 3 different clip sizes. As for dimensions, the tray is 19 by 5 inches and 1.35 inches high. The pegs on which the sockets are placed are made out of plastic. While this might be a major issue for some when it comes to durability, the issue gets even worse. Due to their size and shape, sockets are quite difficult to insert into a peg. It takes a lot of force to push the socket down. 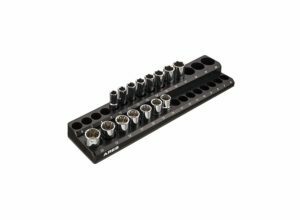 Neiko socket tray organizer is a good addition to any toolbox. 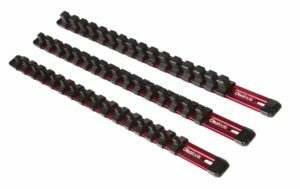 The big advantage comes with the fact that it is a set of 3 trays which allows for greater freedom when it comes to sorting the sockets. The trays are deep and come in 3 different sizes. Construction is fairly decent as the trays are made from a lightweight but flexible and durable plastic. 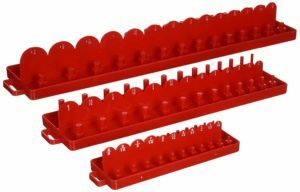 Each peg on the trays have a tightening mechanism and can hold the sockets securely in place without any wobbling. The pegs hold the sockets very well but only when they fit properly. The main issue is that the pegs are quite close to each other. This causes some pegs to be unusable when the ones next to them have a socket on. It is not a common rule but it tends to happen often enough depending on how the sockets are arranged. The Ares socket holder is an interesting model with a slightly different design when compared with other socket holders. This particular model is a magnetic holder which means that sockets do not need to be locked manually onto a peg. It has a plastic base with magnets built in. Capacity is also quite decent. A tray can hold up to 15 different sockets and the socket slots have multiple sizes. The model can also be found in a 30 pc size and it is still not that expensive. The magnets used to work but only to a certain extent. It becomes obvious that the tray is not that great if for example we place one large socket and the tray is oriented facing downwards. The socket will fall off due to its weight and the fact that it is quite heavy. The Ernst Manufacturing socket organizer is by far the most inexpensive product on our list. It is also one not that large since it can only hold 15 sockets. For the vast majority of users, that will be enough. The organizer has plastic pegs with a simple twist-lock mechanism. The organizer also has a small hole that allows it to be mounted vertically on a wall. Last but not least, the model is available in 3 different sizes, 3 different colors and it includes a lifetime warranty. Erns also offers similar organizers for their trays and for the most part, they are compatible with each other. However, this particular organizer does not appear to be universal. It will not fit on all the Ernst trays. It works with some but not all of them. 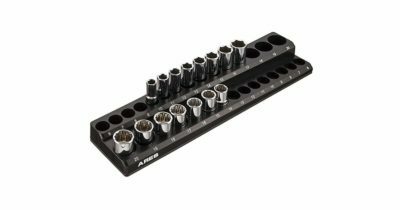 The Ares 3-piece socket organizer offers great value for the money. 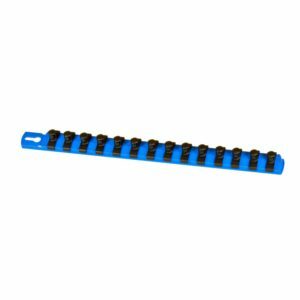 This simple kit comes are 3 individual strips in the form of rails that have small clips with spring loaded balls which holds the socket. Each rail can hold a maximum number of 16 sockets and can hold the sockets firm enough that they will not fall off even when they are facing down. The clips that hold the sockets are removable while the entire construction of the rail is machined aluminum. The keeps at the ends of the rails are meant to prevent the clips from sliding out. While the whole idea or concept is good, the execution is lackluster. The issue comes from the fact that the keepers on the ends of the rails tend to fall off. They can be glued on if needed to prevent this from happening. MLTOOLS socket rail tray is a bit more expensive than regular socket organizers but it is also quite big. 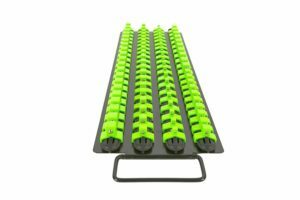 It consists of 2 individual trays and each tray has 3 rails with 15 clips each which means that 90 sockets can be stored in total. The trays are made mostly out of aluminum and have universal twist-lock. They are available in several different colors and can even be purchased as single rails. As a bonus, the socket organizers come with a limited lifetime warranty. Holding 45 sockets on a single tray can be a lot. This amounts a lot of weight that will simply push down onto the tray. When lifted, the tray can bend a bit under the pressure of the weight. It is possible to bend them completely if the trays are overloaded with sockets. Olsa Tools offers a great socket organizer in the form of 3 rails made out of aluminum. Each rail can hold 16 sockets for a total of 48 sockets. The clips of the rays can be moved left and right to make room for larger sockets. Also, they have spring loaded ball bearings that do a very good job at keeping the sockets in place. The rails themselves are quite sturdy and can be mounted on a wall or even a workbench. Last but not least, the socket organizer is fairly inexpensive and can be purchased as single rails instead of a set. Despite giving the impression that the rails are durable and sturdy, they become a bit flimsy when there are 16 sockets on them. The weight makes the flop down or bends a bit. It is better to mount them onto a flat surface to avoid having the rails bent beyond repair. The TEKTON 1885 socket holder set offers great value for the money. It does not have the best design but it is very inexpensive and works well. 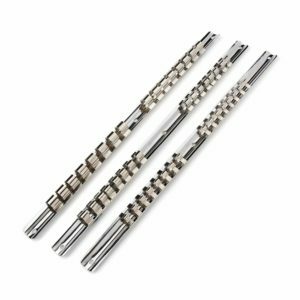 The set is made of 3 individual rails built from steel and with a Nickel plating. Each rail can hold 16 sockets which add up to a total of 48 sockets. The clips that hold the sockets are also made of steel but they act as springs. As for the rails, they have small holes on the ends which are meant to be used to mount the organizers onto a wall or workbench. The clips work very well with most sockets. They become a bit flimsy when a large socket is inserted. Because of the weight, the clip is not strong enough to hold the socket in place properly. As long as the rails are mounted horizontally, the clips should work just fine. 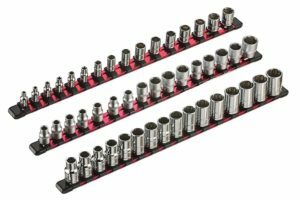 Ernst Manufacturing socket organizer comes as a complete set which includes a large tray that holds 3 individual rails. Each rail can be removed and can hold up to 15 sockets for a total of 45. The rails in the set have different sizes and have a twist lock mechanism that keeps the sockets properly in place. The set itself can be found in 2 different sizes and 2 colors. There is a 13 inch and a 19-inch size and it can be found on the rails either red or blue. The clips on the rails are made out of plastic. This should not be much of an issue for two of the trays but the one that has the smallest size feel a bit flimsy. They feel fragile but since they will be used for smaller sockets, they should do just well. Hansen Global 92000 socket storage set is one of the best products that money can buy. It is a bit more expensive but it also offers much more storage. 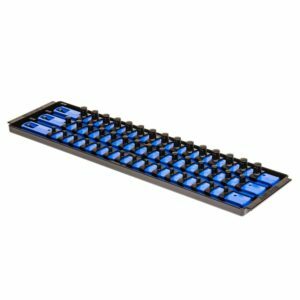 The set includes 6 individual trays that are made entirely out of durable ABS plastic. The number of sockets that they can store varies from one tray to another. Each pet has a visible writing that indicates the size of the socket which makes it even easier to properly organize. The pegs are very tall. Their design makes them both useful and practical. The main problem that most will have is that the plastic construction will make the pegs feel a bit flimsy. There are loads of socket organizers available. A lot of them seem to be identical but have a different branding and price tag. Some might get tricked into overpaying for a socket organizer which can be found cheaper. This is why we put together our list. We found 10 socket organizers that are worth spending money on but which one to get? Size or capacity: The size or capacity of a tray is variable from one set to another. If there aren’t all that many sockets to be stored, maybe getting a single rail with 15 or 16 clips should be enough. A tray with 3 rails should be capable of holding at least 45 sockets. Construction: Most rails are made out of metal and have plastic pegs or clips. It is a standard construction but it is important for the rail to be made out of a thicker sheet of metal otherwise it will bend easily.